Anna’s House is a charming, traditional little house right in the heart of the harbour, perfectly placed for taking ferries, buses or for walking to nearby beaches. Tavernas, shops and all amenities are very close by. Eri, who looks after the house is very kind and helpful, going out of his way to make one’s stay enjoyable. The location and view are sensational. The concierge went out of his way to provide us with basic cooking supplies and was exceptionally conscientious and helpful. The location of the property is ideal, the appartment was really cosy and the view from the balcony was splendid. The location is great and the apartment easy to access with only a few steps to climb. In fact, it is only a hundred yards from the ferry dock but there is very little noise from the activities of the port. The balcony at the apartment was excellent and gave great views of the bay. The apartment itself is typical of the Dodecanese with the beds on raised wooden platforms in an open area upstairs, loved that. Downstairs is cosy and basic, with small but decent bathroom and shower. We spent much of our time outside on the balcony. It's a very cosy and confortable place. You will be surprized by the wonderful view. The host is very kind and cares about the confort of the guests offering free wine and water. Excellent price for the provided quality. Highly recommend. Enjoy your holidays! We were ,met off the ferry , property looks out over harbour. Facilities in the property very good, lovely and clean and close to all the restaurants, bakery, shops etc. Small, toilet didn't flush properly only ONE toilet roll for five days (disusting) was told supermarket next door!!!! Mezmine bedroom - not suitable - overall apartment very poor for over 50 euro per night stayed in far superior rooms for less. We were met as we got off the ferry from Tilos. The property is about 100 metres from where the ferry docks. 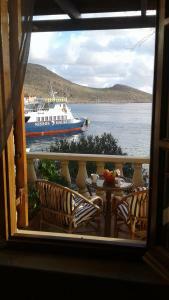 A very Greek house with excellent views over the harbour and close to all the tavernas along the waterfront. Clean and comfortable and very good value for money. Lock in a great price for Anna's House – rated 8.1 by recent guests! One of our top picks in Halki.Opening to a balcony or patio with Aegean Sea views, Anna's House is a self-catering accommodations located in Halki Village. Free WiFi access is available in all areas. Accommodations will provide you with a flat-screen TV, air conditioning and a seating area. There is a fully equipped kitchenette with a refrigerator. Featuring a shower, private bathrooms come with a hairdryer and towels. Tavernas and mini markets are round the corner. Pondamos Beach is 0.6 mi from Anna's House. When would you like to stay at Anna's House? Opening to a patio with Aegean Sea views, this air-conditioned studio includes traditional elevated beds, free WiFi, a fully equipped kitchenette and a bathroom with a shower and hairdryer. This holiday home features a soundproofing, electric kettle and air conditioning. Kindly note that the extra large double bed is in an attic. This holiday home has a soundproofing, private entrance and electric kettle. Διώροφο πετρόκτιστο του προηγούμενου αιώνα που ανακαινίστηκε και εκσυγχρονίστηκε προσφέροντας πολλές ανέσεις. Μια ανάσα από τη θάλασσα, 10 μέτρα από το λιμάνι στην κεντρίκη πλευρά του Νημποριού, ό,τι πρέπει για να χορτάσετε την ανατολή του ηλίου με θέα το Αιγαίο Πέλαγος απ’ το μπαλκόνι σας. Παρότι μεγάλωσα και ζω στην Ρόδο η καρδία μου πάντα είναι στο ωραιότερο νησί του Αιγαίου...Την Χάλκη μας!!! Σε κοντινή απόσταση διατίθενται ταβέρνες καφετέριες και μίνι μάρκετ. House Rules Anna's House takes special requests – add in the next step! Anna&#39;s House accepts these cards and reserves the right to temporarily hold an amount prior to arrival. Anna's House accepts these cards and reserves the right to temporarily hold an amount prior to arrival. Please inform Anna's House of your expected arrival time in advance. You can use the Special Requests box when booking, or contact the property directly using the contact details in your confirmation. The only problem was having to leave to go home! Our booking request was for an apartment with a balcony, but we were originally given the street level apartment. This was remedied quite quickly. The appartment and especially the WC could have been cleaner, especially since there was no cleaning for 3 days. It was a perfect place to stay. Mixer tap in kitchen area was loose. A minor issue but slightly irritating. Easily fixed, I reckon. View was amazing from the room.